If you’re anything like me, hearing food truck and wedding reception together may have rocked you back on your heels a bit. But after planning a few “food truck weddings” I quickly realized the wedding food truck can be a thing of beauty for those who have restricted serving space, want more of a relaxed dining atmosphere, are looking for a cheaper catering option, want to incorporate a popular wedding trend in their big day, and/or long to provide a handful of tried and true tasty local food options for their guests. This concept of food truck wedding catering is a relatively newer one, but there is still plenty of great advice out there for brides-to-be. You’ve come to right place, as your Denver wedding planner Blue Linden has all the specifics you’ll need to make an informed decision about whether a food truck catered wedding is right for you. Are there even food trucks in your area? Most bigger cities have a place where they’ll camp out at peak lunch times. Also, some restaurants have small, mobile versions for catering, so see if your favorite place has that option. Food trucks also frequent the parking lots of busy office buildings and apartment complexes. Scour the newspapers, ask your friends for their opinions, search the internet for foodies in your area, and take a drive to see what types of trucks, if any, you can find before setting your heart on this route. It’s important to know the specifics of your location and the numbers involved. 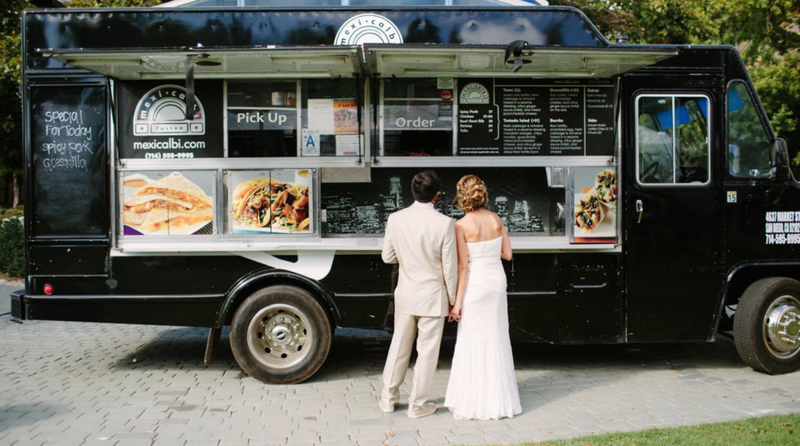 How many people do you have in mind for this wedding food truck to handle; will you need more than one? How much food will the different types of guests consume? What type of food and how many options do you want to provide? Is there seating or will it be a standing/picnic style atmosphere? What’s the weather going to be like - will your guests get uncomfortable waiting in line in 20° weather? Will everyone be okay with standing in line waiting for food or should you organize another method of getting the food from the truck to your guests? How long will it take to serve that many people, and how long do you have your venue reserved? Can a food truck even park at your venue, and if so, is there adequate lighting, trash removal, and enough clearance for any equipment that the truck uses? These are all questions that should be considered and carefully worked out before you decide if food truck wedding catering is right for you. Utilize the knowledge of the food truck owner/operator. Ask them all the questions you can think of, and they may have valuable information you didn’t even think to ask about. Talk out the specifics of pricing and cost-cutting (if that’s an issue), and while holding on to the vision you want of your wedding reception (and putting your negotiating skills to the test), be open to putting their knowledge of the food/service industry into play as well. Build a relationship with them and do so well in advance of your big day; it would be devastating for them to drop out close to your wedding day and ruin your image of the perfect food truck catered wedding. Most food trucks can be pretty ugly, so put thought into sprucing it up a bit. Using a ventilated tent (which can also come in handy in an unplanned, weather-related incident), hanging some twinkly lights, making up a hand-written menu (and personalizing the items on it with fun names) are just a few ways to make a wedding food truck become part of the ambiance and theme of your reception. It’s important to know that the food truck can serve as your main reception meal or simply as a late night snack after your guests have polished off a few cocktails and are looking for a pick-me-up before heading home. The wedding food truck can be modified to fit whatever best suits your needs. Oh… and don’t forget to capture beautiful and lasting photographs showcasing your choice of food truck wedding catering that will be unique and trendy reminders of your big day! Knowing that there is so much on your plate while planning a wedding, hiring a wedding planner or wedding coordinator would be extremely beneficial, especially in a situation like this one. Not only does your Denver wedding and event planner Blue Linden have experience in dealing with all sorts of vendors, we also have exclusive insight, thoughts, and information to help take the stress of choosing the right food truck catered wedding (and handling all other wedding-related details) off your shoulders.